To Cite: Almotlaq A M. Laparoscopic Management of a Cholecystocutaneous Fistula: A Case Report, J Minim Invasive Surg Sci. 2015 ; 4(4):e32036. doi: 10.17795/minsurgery-32036. Introduction: A cholecystocutaneous fistula an abnormal epithelial tract that allows communication between the gallbladder and the skin, manifests as a rare complication of gall stones.The treatment of choice is definitive surgical excision of both the gallbladder and the tract, usually by an open operation. However, a laparoscopic approach is another option, especially if the patient is elderly and has other co morbidities. We report a case of a laparoscopically managed cholecystocutaneous fistula. 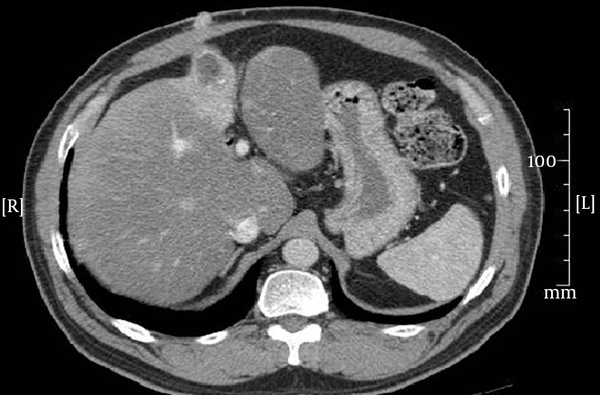 Case Presentation: A 55-year-old male with comorbidities presented with a discharging sinus at the right upper quadrant area after an abdominal wall abscess drainage. 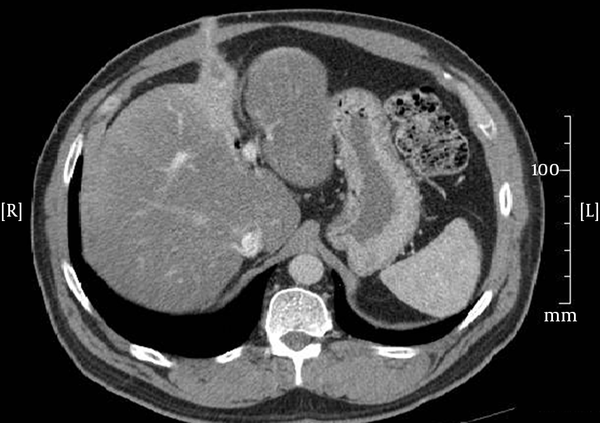 A Computerized tomography scan showed a biliary fistula. Laparoscopic cholecystectomy was carried out successfully. Conclusions: Laparoscopic cholecystectomy is a safe and feasible technique to manage cholecystocutaneous fistulas. A fistula is an epithelium-lined tract that connects two epithelial surfaces. A cholecystocutaneous fistula is an abnormal epithelial tract that allows communication between the gallbladder and the skin (1). The condition typically arises as the result of a calculous disease and is very rare. The declining incidence of this condition is likely related to prompt diagnosis, the availability of antibiotics, and early surgical intervention for cholecystitis and empyema (2). Treatment of this condition usually involves definitive surgical excision of both the gallbladder and the tract through an open operation. 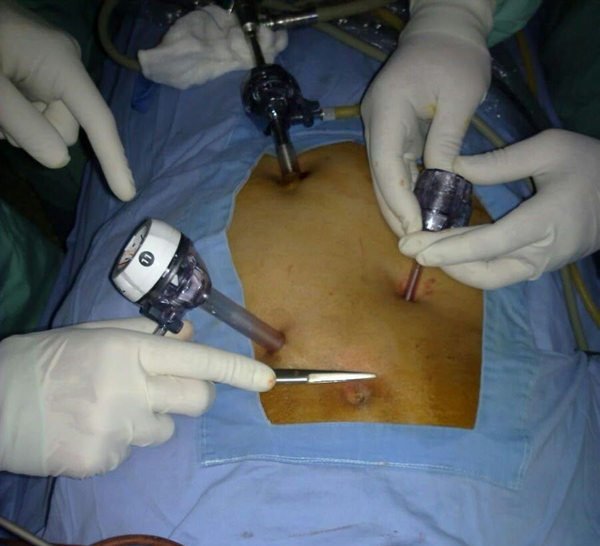 laparoscopic approach is another treatment option, especially if the patient is elderly and has co morbidities (3, 4). We report this case for many reasons. Mainly, because of the rarity of the disease and the long history of this patient before diagnosis in order to share our surgical experience with colleagues. In addition, the patient had no contraindication for laparoscopic approach which will offer him a smooth post-operative recovery. The aim of this article is to emphasize on the laparoscopic approach as a tool to treat such conditions. A 55-year-old man with diabetes, hypertension, and asthma presented with a 2-year history of a discharging sinus in the right upper quadrant. Three years earlier, the patient was endoscopically treated for obstructive jaundice and had a return appointment for a cholecystectomy. He chose not to undergo that procedure, but 3 months later was admitted with acute cholecystitis that required a cholecystostomy. Two weeks after the drainage tube was removed, the patient was discharged with another appointment for a cholecystectomy. Again, the patient did not attend his appointment, but presented 3 months later with an abscess in the right upper quadrant in the area where the drainage tube had been located. An incision was made into the abscess to drain it, and intravenous antibiotics were administered. The time between this treatment and his current admission was marked by continuous discharge from the area of the abscess. Upon presentation, the patient reported constipation in the absence of abdominal pain or other gastro-intestinal symptoms. Clinically, the patient appeared well and had vital signs within the normal ranges. The patient had pus discharge from a sinus in the right upper quadrant area (Figure 1), but there was no evidence of inflammation or any palpable mass. Results of liver function tests were normal, as were various parameters of haematology and clinical chemistry. Radiological workup through a fistulo-gram (Figure 2) and a computed tomography scan (Figures 3 and 4) suggested the presence of a cholecystocutaneous fistula. Figure 1. The surgeon describing the site of the fistula intra-operative. Figure 2. 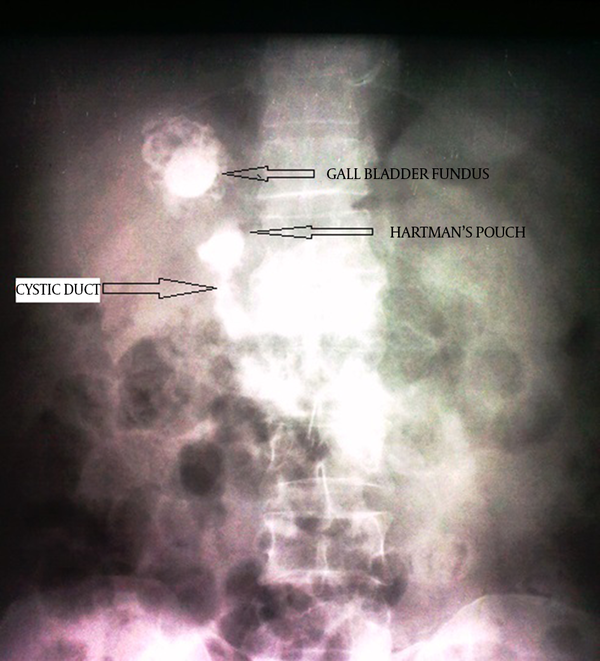 A fistula-gram showing contrast reaching the gall bladder. Figure 3. A computed tomography scan showing the tract of the fistula. Figure 4. Another CT scan picture showing the tract of the fistula. A classical laparoscopic cholecystectomy was conducted with excision of the fistula tract. The sinus was also excised using an elliptical skin incision and primary closure. A sub-hepatic drain was inserted for 24 hours, and the patient was discharged on the second postoperative day after demonstrating a tolerance for oral food intake. A postoperative histopathological examination revealed chronic non-specific inflammation without any evidence of malignancy. The patient provided consent for the use of non-identifying information in this report. Since the beginning of the twentieth century, the number of diagnosed cases of cholecystocutaneous fistula has decreased dramatically. In 1890, Courvoisier reported 499 cases of perforated gallbladders; of these, 169 resulted in the formation of external fistulas through the abdominal wall (5). In contrast, between 1900 and 1975, only 31 cases were reported in the literature (6). Fewer than 20 cases have been reported in the published literature over the last 50 years (7). When these fistulas develop, most patients report a history that is suggestive of a biliary origin or secondary to a biliary procedure. Patients developing fistulas after a cholecystostomy, such the present patient, comprise a large number of the reported external biliary fistulas, despite their rarity (2). Most of the patients are women in their 60s, as this population segment has a high incidence of gall stones. The development of a cholecystocutaneous fistula begins with suppurative cholecystitis, which eventually leads to perforation, either internally or externally, through the abdominal wall. Typically, a patient with a cholecystocutaneous fistula presents with a discharging sinus in the right upper quadrant area. However, the discharge can also originate from the umbilicus, left costal margin, right iliac fossa, right side of the groin, and the gluteal region (8). The discharge may include bile, pus, or mucous. A fistula is usually diagnosed using a trans-abdominal ultra-sonogram that delineates an abscess communicating with the gall bladder. A computed tomography scan, as was performed in the present case, can also demonstrate the fistula tract. A fistulogram may also be a helpful tool for determining the origin of the fistula if a diagnosis cannot be obtained. During the acute phase, cholecystocutaneous fistulas are usually managed by incising and draining the abscess, in conjunction with the administration of appropriate parenteral antibiotics. Once the acute phase subsides, the patient is admitted for an elective cholecystectomy and excision of the fistula by the open technique (2, 9) Laparoscopic approach is another option whenever feasible (4). We conclude that laparoscopic approach is a safe and less stressful management technique, especially for elderly patients with co-morbidities. We recommend the laparoscopic approach as a standard technique for the management of cholecystocutaneous fistulas after a malignancy has been ruled out. My acknowledgment to Dr. Mohammad Aboualghait and Dr. Mekki Hassan for their help and care for the patient. Also, my acknowledgment to Editage.com for their guidance.